We read a lot in this country about “DOING THE RIGHT THING” Apparently astronauts are good at it. As are soldiers and marines and service men and women of all stripes. Nuns, I understand are good at it. At least I found them excellent teachers and one of them gave me a cure for hiccups that works like a miracle – or charm, depending on which side of miracles you come in on. But on the whole, we, the average run of the mine kind of people…I don’t think we’re real sure right now just what constitutes that elusive Right Thing. I’ve been particularly aware of Right Thing challenges for the past several Politically Correct years. But it has really intruded on my world recently. For one thing, almost all of the rules regarding correct behavior that were sacrosanct in my growing years are now gone. Discredited if not down right insulting to many. Like the bit where a gentleman stood up when a lady entered the room. Oh dear, I can’t even imagine the number of PC errors I’ve made here. First of all, the term “Lady” seems to have taken on a strange glow. A Lady used to be a woman with dignity and fine manners and usually a caring attitude…sometimes a demanding attitude to be sure but that’s different problem. Now it is seen by many, as a synonym for weakness I think. Apparently, by standing up when a lady entered the room, a gentleman was suggesting that she was incapable of getting from the door to a chair on her own. Today’s woman frequently takes umbrage at this kind of thing, seeing it as more of an accusation that she can’t get her own damn chair. I’m not suggesting that we return to that gesture – and that’s what it was intended to be – a gesture of respect. Kind of nice, but hardly an issue. Besides, I like those gestures. Right now I am busily trying to follow more urgent Right Things. I have cut my shower time…first to five minute every day. And then, because I didn’t feel all that refreshed, making it a 10 minute shower every other day. Then I moved on to the part about the dishwasher. Dishwashers, by their very nature, use a whole lot of water, so it is suggested that we use them only when we have filled them. I tried that. But food left on the dishes dries on the dishes and often stays on the dishes, particularly if, like me, you live alone and only fill the machine every four or five days. Besides, who wants to store dirty dishes for a week? So I tried filling the sink with very hot water and then putting all the dishes in to soak so that when I put them in the dishwaher, all the easily removed stuff will be gone. And then I read that all the running water it takes to rinse things is at least as much as the dishwasher was going to use in the first place. Okay. Still trying to do the right thing. I hand wash most dishes and use the dishwasher when I have had a large group to dinner. No. there are other methods, and I had to put aside one of my favorite hates in order to try this one. Now, paper plates are quite anathema to me unless and until you are off on safari somewhere in which case, of course, don’t be silly. You do what must be done. In this case, I took to serving my own meals…when I was sure no one would ever see.. on paper plates! Right. I still hate them, but I DID feel holier than a lot of thou(s). And you knew by now that there was an until lurking didn’t you? Until I read that paper towels and plates etc were overloading the trash collections of the world and we should limit our use of those things. I’m back to china and linen…If I’m going to be disapproved of, at least I will be comfortable. Those are a couple of the easier things that are bugging me. I hesitate to get started on the bigger, more controversial problems. Because I am aware of the uproar some of them incite. A: Dietary choices (example, the tendency of non meat eaters to flood Face Book with horrific videos of animals being viciously mistreated. I do not question the value of their stand against cruelty to animals. I do believe they go overboard on the not-very-subtle suggestion that pro-meat eaters must be willing co-conspirators in the anguish. B: Immigration: Are all people who are not like us for whatever reasons, therefore unworthy to share what we already have? C: Politics: Are men and women really evil because they choose to identify with the Republican as opposed to the Democratic party…Or Vice Versa? We really must begin to paint all of these problems with narrower brushes. The wide sweeping condemnations that show up every day in (anti)Social media are driving us all insane and making it harder and harder to approach any subject that can be considered even minimally controversial, as anything but a cataclysm waiting to happen. I once hoped to start up a discussion group among my friends. But I have been appalled by the hate that fills the pages of my computer every day and I can’t imagine having a civilized discussion.. What is even more daunting is that much of it comes from my friends. They are liberals and want the best for everyone but can’t seem to abide anyone who doesn’t plan on giving it to the world the way they think it should be given. Theoretically we all claim to want everyone to have the right to his or her own opinion. But reading Facebook, what I read is that what you think damn well be what I think too. AFTER THOUGHT: I just finished reading a piece in the Wall Street Journal that suggests that ranting is not necessarily the good thing we have been told it is. Somehow the idea that we have some kind of anonymity has given folks a false feeling of security so they are free say every hateful thought they are nurturing – if only for a matter of minutes. One unfortunate soul apparently went on line with a really nasty opinion of his – need I say – former Boss. Boss read it. Man is looking for work. Maybe Think First is still a good plan. SECOND AFTERTHOUGHT: What’s really scary is that Donald Trump is the Republican front runner to fix our problems…and apparently he hates everyone. And now we move on to the Bird of the Month portion of this Blog. Bobill Weaver, whose photographs of birds – whether in flight or sometimes in quiet family mode –inspired me to ask if he would share some of his favorites . 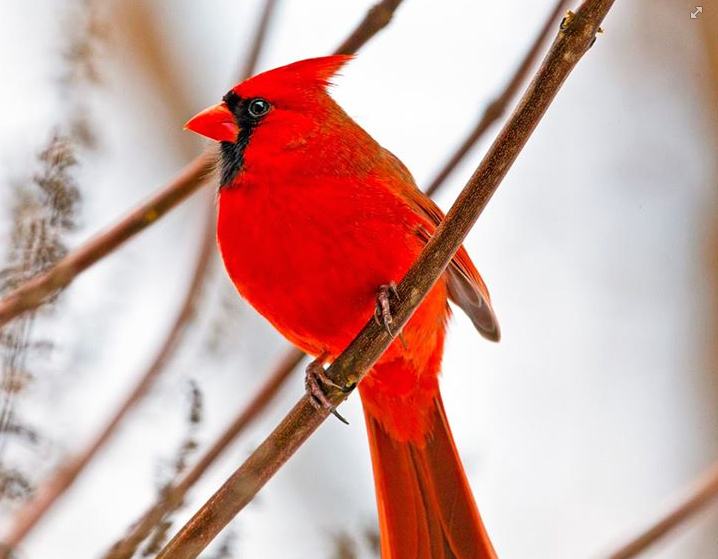 This Cardinal is but one of so many and they are all beautiful…and sometimes funny. The Cardinal, however, seems a perfect picture of regal. That’s just my opinion, but I feel very strongly about Cardinals.